The digital version of PS4 games is cheaper than other versions and consists of a key that is entered into the PSN account to activate the download of the game. In this case, the key format version of Mortal Kombat 11 for PS4 can be purchased at any of the stores listed in Gocdkeys. This version is usually cheaper than the physical version, although it may have a regional block, i.e. it can only be activated from certain localities or regions. We also have the possibility of buying it in account format, in which instead of entering a password in PSN, we must access with some data (username and password) to an account that already contains the game. For this last format we recommend to read all the information about return restrictions and activations before buying it. 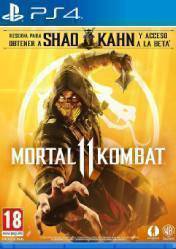 Looking for the best deals and prices for Mortal Kombat 11 of PS4 before release. The first price that appears in our list of prices and shops for Mortal Kombat 11 of PS4 is an account format, hence it has a cheaper price than other versions. Remember that both physical and digital versions of PS4 games can have regional blocking, as is the case of the second store that appears with a price of 56.96€ which is a version for the United States. The versions of amazon and the rest of stores for Mortal Kombat 11 are physical versions and have a higher price. Mortal Kombat is back with a new installment of this bloody, iconic franchise of fighting games dating back to the early 1990s. This new installment includes brutal new variations on character customization, giving you unprecedented control of the fighters. It has been built with a powerful new graphic engine that shows all the destruction we can cause in our rivals, making it even more spectacular. Remember also that from Gocdkeys we offer support for any online store selling digital video games, so if you have any problem do not hesitate to contact us through our contact tab. There are no comments yet about Mortal Kombat 11. You can be the first one! Mortal Kombat 11 - New leak reveals entire MK11 dlc roster!